We have three contests to determine the winners for today. Now that I have my comments paginated and numbered, drawing winners will be a much easier task! Out of 239 entries, the winner of the Label Daddy Camp Pack contest is . . .
Out of 69 entries, the winner of the Halls Cough Drops contest is . . .
Out of 48 entries, the winner of "The Necromancer" Book contest is . 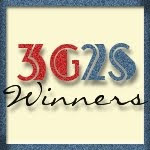 . .
Congratulations to our three winners! I will be sending out email notifications right away. Please respond within 48 hours to claim your prizes. Thank you to all who took the time to support my sponsors by entering these contests.